Open the OGL module and select "Gradient tool" in the "Options" popup menu. Drop a graphic (rectangle, polygon, roundrect or text) to the topwindow. It is recommended to use click and release rather than click and drag because the color selector is using the mousewheel, vertical for changing the saturation and horizontal for changing the alpha. 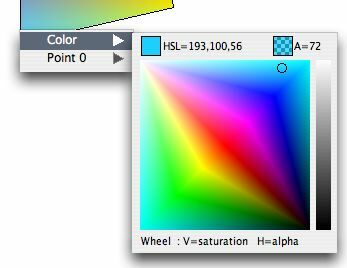 The color selected will be linked to the clicked vertex. indicating that the color will be set for the two vertices of this edge. OpenGL interpolates the colors between a vertex and the next one. But for setting a gradient of an area, one needs three points. OpenGL uses the first vertex of the polygon for its interpolation. The "Point 0" item allows setting this reference vertex to any vertex of the polygon or the location, the barycentre or the centre of gravity. In this case, the selected color will be set for all the points of the polygon except the reference point. Which is handy for polygons with many points. If the Custom pointer is enabled, the gradient is recalculated when resizing or rotating the graphic.